The kinetic energy of water flowing downhill in rivers or other streams constitutes an energy source very similar to that of ocean currents. However, unlike other forms of renewable energy which rely on solar activity, a rivers flow is part of the hydrological cycle of water evaporation and precipitation in the form of rain. The flow of water in a river can be regulated by means of sluice gates, penstocks or dam building with the kinetic energy of the moving water being used to drive a cross flow turbine at the times most convenient with respect to utilisation. Although the Earth has plenty of water, not all of it can be used to generate hydro energy. The best rivers for creating power, for example, are located near hills and mountains, where the water runs downhill with a lot kinetic energy, but some rivers move too slowly to be useful. There are limits to the availability of hydro energy. Over the last few decades, small scale hydro-power has become popular because of its clean, renewable and abundant energy resources that can be easily developed. However, finding a suitable and effective water turbine type for a small hydro power system can be a problem. Moreover, relatively high manufacturing cost of the complex structure of the turbine can be a barrier to the development of a small scale hydro energy turbine. 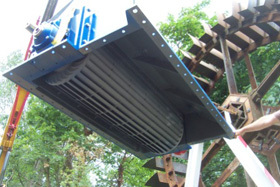 There are several different types of water turbines available which can all be used in a small scale hydro installations. There selection depends on the available head of water and the volume of flow. Power is proportional to the product of head x flow. Therefore, the cross flow turbine is generally used because of its simple structure and high possibility of applying it to a zero head small hydro power scheme without the need for dams or barrages. One of the most basic features of the cross flow turbine is the simplicity of its construction. The cross-flow turbine design is based on concepts from both impulse and reaction turbine designs, but in general it uses impulse behaviour giving the name also of an impulse turbine. The simplicity in its design reduces cost and makes it very suitable for low head and small power scheme use. The cross flow turbine provides power and torque at its output shaft by extracting the kinetic energy from a moving water without otherwise interrupting its natural flow. The cross flow turbine has a drum like rotor with a solid disk at each end and gutter-shaped rotor blades joining the two disks together. Water is guided into the rotor by an inlet guide which directs it under pressure through the rotor the first time, through the drums interior transferring some of its momentum, and then through the rotor a second time before exiting the turbine at ambient pressure. Then the cross flow turbine converts the flow and pressure of the water to mechanical energy. This action results in very little pressure drop across the turbines blades thereby increasing its efficiency. Due to the angular momentum of the water flowing across the turbine rotor blades, the kinetic energy of the water is converted to a torque at the output shaft which in a small scale hydro power system can be used to drive an electrical generator. Then the cross flow turbine turns a generator, which is connected to electrical loads to power a single home, building or a very small installation depending upon the electrical generator used. However, energy is always lost when it is converted from one form to another in the form of frictional losses and spillages. Although higher than other types of turbine design, cross flow water turbines rarely have efficiencies better than 85%. However, by careful design, this loss can be reduced to only a small percentage but a rough guide used for small systems of a few kW rating is to take the overall efficiency as approximately 50%. Thus, the theoretical power must be multiplied by 0.50 for a more realistic figure. There is widespread potential around the world for localised hydro energy production from rivers and canals using “zero head” cross flow turbine designs which require no dams or barrages. The kinetic energy in rivers and canals is a predictable energy resource, which is readily available 24 hours a day and can be exploited by using current cross flow turbine design and technology. For more information about “Cross-flow Turbines” and how you can use them to generate your own electricity using the power of water, or obtain more hydro energy information about the various small scale hydro energy systems available, or to just explore the advantages and disadvantages of hydro power, then Click Here to order your copy from Amazon today about small scale and low head hydro systems which can be used for generating electricity. Dear ,I am working on hydro power project having basic Data,Discharge =80Cusec/sec,g/Head=16FT,Loction=Akram Abad ,Sakhakot,Malakand,KPK,Pakistan. I’m doing a project design and feasibility of a hydroelectric plant , in an irrigation canal that receives water from the Colorado River USA. Along the canal there are gates, where there is a high to generate electricity and connect to the mains potential. At the points where the study was an average flow rate of 45 m3 / sec and an average channel velocity of 1 m / sec, same as in the gates can be raised by manipulating the gates. As in the area of the gates do not have much depth, it thinks it would be good to design a waterwheel. Via email I could send photos and a video of the place , to have the clearest idea. Hello Isaac, you can find more information here about the different types of waterwheel designs available. I need to buy a micro hydro generator. Every time I try to find one I end up on some site in China and cant figure out how or were to buy it. Anyone else out there find anything please send me a message, or post.